As mental-health professionals see increasing numbers of women arrested for domestic violence, the need for effective resources also increases. Choosing Nonviolence fills this void, providing an interactive and comprehensive treatment tool. 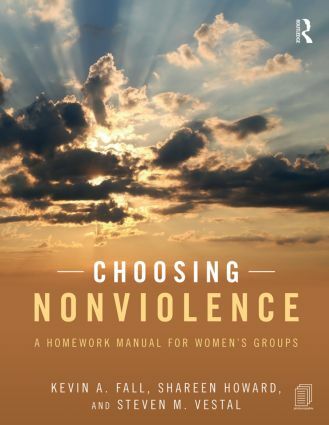 If you are a group leader, Choosing Nonviolence will provide materials to deepen your current group curriculum. Interactive lessons and exercises cover important topics such as trust, respect, parenting, substance abuse, safety planning, and achieving nonviolence. Each chapter contains stories from actual group members to illuminate important dynamics as well as "tool" exercises designed to provide an opportunity for your group members to learn vital skills. If you are a group member, you will find this book to be an important supplement to the work you are doing in group. The personal stories from women who have been in group will show you how they have stumbled and succeeded on their path to change. You will get to learn from these experiences and will see how you can integrate the lessons into your own life. The exercises will enhance your participation in group, and the homework assignments will deepen your growth outside your counseling time.